Award winners Erica Martino and M.J. Winey (center) with their mothers Sue Martino (l) and Tracey Winey (r). 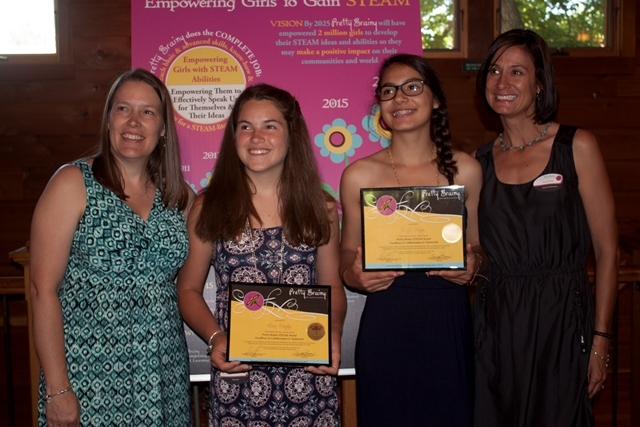 On June 14, 2015, Pretty Brainy honored young designers who are showing the world how STEAM* is their tool for making their communities and world a better place. 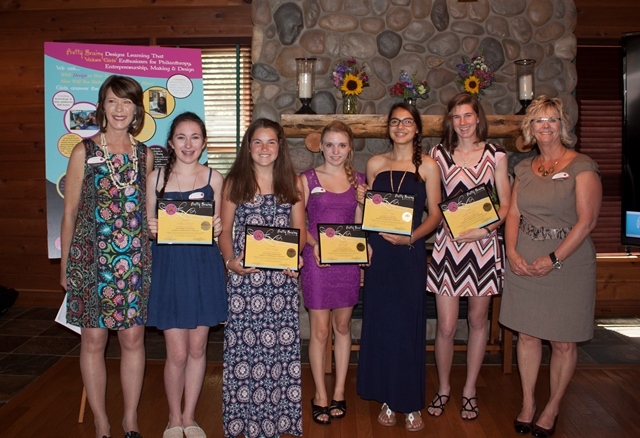 The Pretty Brainy Board of Directors chose each honoree for her work in rolling up her sleeves, getting her hands dirty, positively contributing to her world, and understanding what she made and its significance for others. Eight girls and young women were the recipients of the first-ever Pretty Brainy STEAM Awards, which the Pretty Brainy Board of Directors announces will be an annual event. 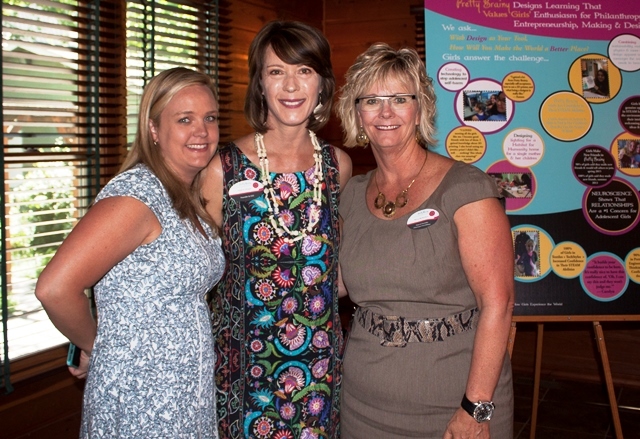 Charisse Bowen (l), member of the Pretty Brainy Board of Directors, and Heidi Olinger, Pretty Brainy founder, with Nancy Richardson (r), host of the inaugural Pretty Brainy STEAM Awards. The event was held June 14 at the historic Edwards House, Fort Collins, Colorado. Bowen, Olinger and Richardson presented the awards. The inaugural ceremony was hosted and underwritten by Nancy Richardson, founder, the OtterCares Foundation, and co-founder, Blue Ocean Enterprises. Richardson joined Pretty Brainy board member Charisse Bowen and yours truly in presenting the awards. Winners of the Pretty Brainy STEAM Award for Excellence in Collaboration & Teamwork, with Heidi Olinger and Nancy Richardson, (l to r) Autumn Gooseff, Erica Martino, Taylor Lyle, M.J. Winey, and Lizette Van Zyl. In announcing the award for Excellence in Collaboration & Teamwork, we told the crowd gathered for the Sunday afternoon event that among the experiences we present girls is the challenge of learning to collaborate and work on a team. Pretty Brilliant, our current service learning project, is made up of six teams of K-12 design engineers, mentored by collegiate women studying engineering at Colorado State University. While all teams perform great work, one team stands out for its unwavering focus and unity. We recognize the brilliance of these members in working as one to devise home interior stairway lighting that is simple, yet utterly centered on the lifestyle and safety of their client, the Rzonca Family, and Habitat for Humanity. 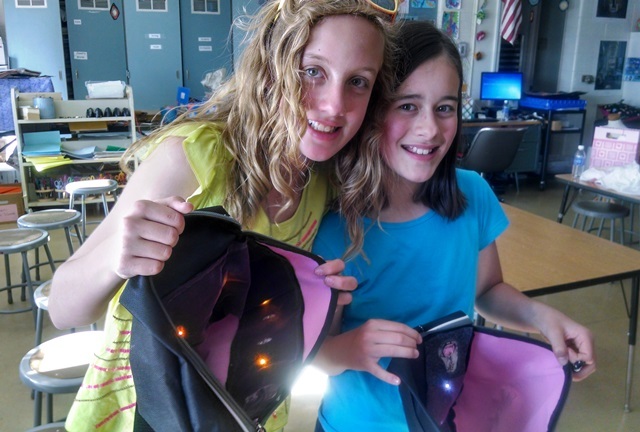 Lacy Miller with Madeleine Colbert and their prototype for an interior-lit backpack. The award for Excellence in Design Thinking honors Lacy’s embrace of design as a critical process, not just an end product. Design, we told guests, “requires the maturity and insight to have a plan, yet to yield that plan in the face of challenge or opportunity.” It demands the resilience to revise and revise again and to learn to shake the hobgoblins of perfectionism. Lacy, who has been a student of Pretty Brainy programs since the 4th grade, will enter the 7th grade this fall. Her multiple design projects include an interior-lit backpack, the prototype for which was a collaborative endeavor with her friend Madeleine Colbert. 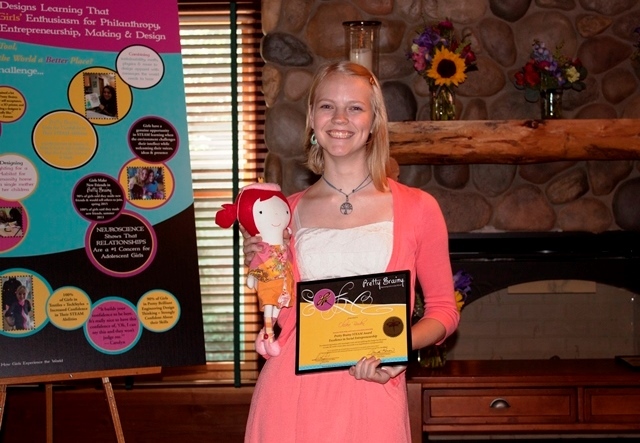 Olivea Borden, winner of the Pretty Brainy STEAM Award for Excellence in Social Entrepreneurship, with her design, the Oli-Bo-Bolly Dolly. Pretty Brainy honors Olivea Borden for exemplifying how design has the power to improve lives, that youth is no impediment to entrepreneurship, and that sustainable practices can be inherent to and inform great design. Olivea’s business model is based on buy-one-gift-one. For each Oli-Bo-Bolly Dolly purchased, a second doll is given to a little girl in a third-world country. Every dolly includes a message for its recipient that she is someone who is special and loved. Women in Nicaragua sew the dolls, which empowers them with meaningful work and the means to support their families. 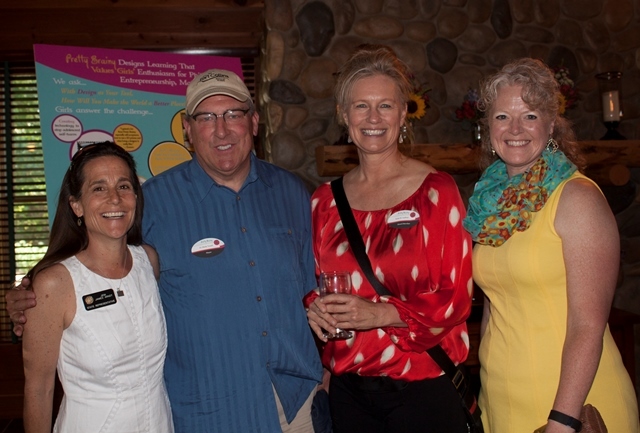 Guests included The Honorable Jeni James Arndt; Dr. Wade Troxell, mayor, Fort Collins, CO; Katie M. Hoffner, member of the Pretty Brainy Board of Directors; and Lisa Rephlo, executive director, Colorado Clean Energy Cluster. The event also was an opportunity for us to thank the OtterCares Foundation for being a major supporter of our approach to girls in STEAM education. Gary Rogers, OtterCares executive director, honored us by telling guests that the foundation does not merely fund organizations and sees its support of Pretty Brainy as an investment. 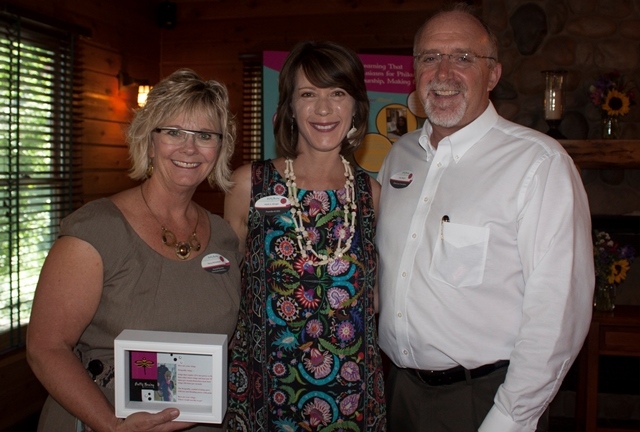 Nancy Richardson, who founded the OtterCares Foundation, with Heidi Olinger and Gary Rogers, OtterCares executive director. Visit the OtterCares Foundation to learn about its work in championing innovative education that inspires young people to be entrepreneurs and philanthropists.